High speed, short telephoto lenses like this are useful for outdoor portraits, theater and sports under extremely poor lighting conditions. This model from Zeiss features a fast f2.0 initial aperture and an all new, more complex construction using 11 elements than the earlier high-speed designs from the late 80s and early 90s. With anomalous dispersion glass used in the design along with the firm’s Apo designation means it should be better corrected for chromatic aberration than the more common achromatic lenses. 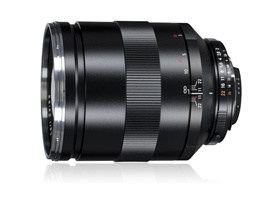 This manual focus though aperture coupled model has ‘floating’ elements for improved image quality at short range and focuses to an unusually close 0.8m (2.62 ft.). Available in both Canon and Nikon mounts, the Nikon mount (ZF.2) version reviewed here retains a manual aperture collar. It’s a useful addition for filmmakers but also provides backwards compatibility with older Nikon SLRs. At $2,500 and weighing 920g (2.02 lb) for the Nikon mount version, this large and heavy lens has a 77mm filter thread and measures 128mm in length. Along with the new Otus 1,4/55, Zeiss produce the two top performing primes in our database when analyzed on the Nikon D800. 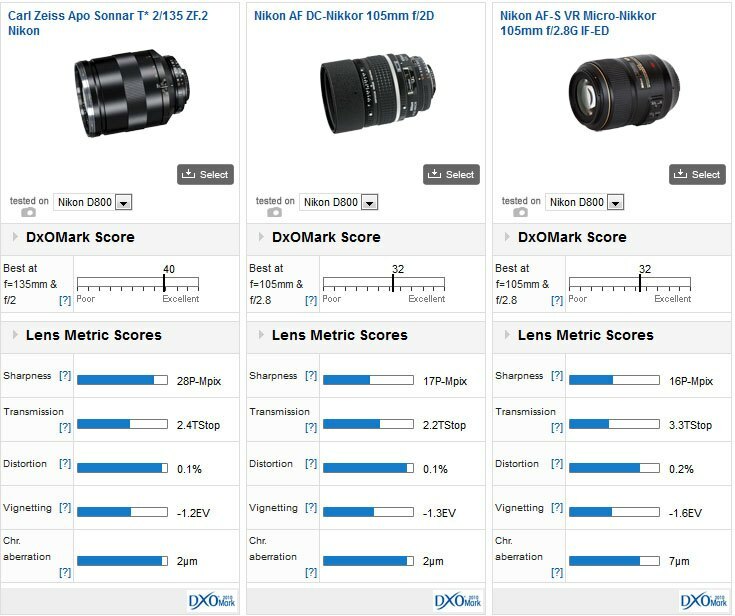 Although the DxOMark scores are close to the Otus and match the AF-S Nikkor 85mm f1.4, the peak sharpness score is significantly higher than the highly regarded Nikon lens and very close to the $4,000 Otus 1,4/55. Most of the gains in sharpness over the Nikkor will be made across the frame at wider apertures. Typically, 135mm lenses are much easier to design and produce than other focal lengths, but this is a high-speed model and aberration correction remains challenging. Compared with others of a similar focal length the superior image quality of the Zeiss is quite clear. 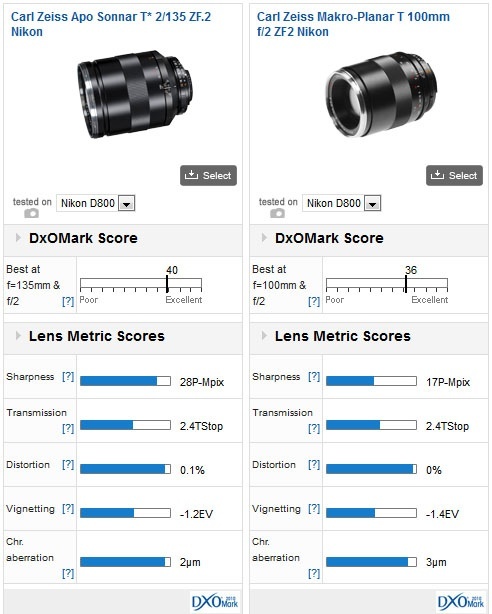 With a DxOMark score of 36 points, even the highly regarded Zeiss Makro Planar T* 2/100 is far off the peak sharpness of the Apo Sonnar T*. 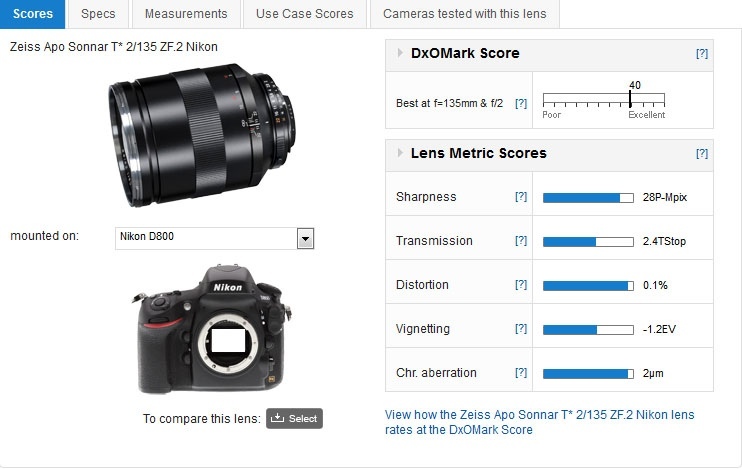 Perhaps unsurprisingly, the Zeiss Apo Sonnar achieves a very high DxOMark lens score of 40 points, and achieves an equally extraordinary 28P-Mpix Sharpness score on the 36-Mpix D800. Not only is it pin sharp at full aperture from corner to corner, sharpness levels at f2.8 are similar to those at f5.6 on rival offerings. Chromatic aberration is also extremely low, as you might expect with a lens boasting four anomalous partial dispersion glass elements and an Apo moniker from a firm such as Zeiss. Distortion is low though it’s not really likely to be high on a lens like this. Vignetting is similarly low while transmission is still very good at 2.4 T-Stops. The Zeiss Makro-Planar is regarded one of the sharpest lenses from the firm and yet the Apo Sonnar T* has significantly higher sharpness that model. Both have good uniformity across the image field from the initial aperture but the Makro-Planar simply can’t match the sharpness of the Apo Sonnar T* at any aperture setting. Both have similar transmission and negligible distortion in the case of the Apo Sonnar though that model also has slightly lower, softer looking vignetting and lower levels of chromatic aberration. Although we’ve yet to assess Nikon’s highly regarded AF DC-Nikkor 135mm f2.0D model, we have analyzed the 105mm version. These lenses with their defocus control (DC) for blurring backgrounds were really high performers in their day and still perform well on high-resolution DSLRs today. However, the Apo Sonnar T* is significantly sharper than the 105mm version and also outperforms Nikon’s latest AF-S VR Micro-Nikkor 105mm f2.8 IF-ED. The macro performs very well and has high corner sharpness at full aperture but like the Zeiss Makro model it can’t match the Apo Sonnar T* for peak sharpness at any aperture. It also has rather high chromatic aberration and noticeable vignetting for a macro lens. The Nikkor 105mm f2.0 DC has similarly low CA to the Apo Sonnar and it even has excellent illumination and transmission, but it doesn’t allow high-resolution bodies such as the D800 to reach their full potential. The fixed 135mm focal length isn’t as popular as it was once mainly due to lenses like the 70-200mm f/2.8. Nevertheless, fast lenses like this are making a comeback. The Zeiss Apo Sonnar T* is without doubt one of the finest 135mm f2.0 lenses ever produced, and at $2,200, even the price doesn’t seem unreasonable for quality like this.